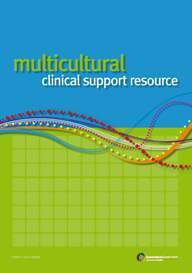 The Multicultural Clinical Support Resource folder provides ready-reference information on issues that affect health care provision to people from culturally and linguistically diverse backgrounds. It contains information and advice on topics such as communication, the impact of culture and language on health care, working with interpreters, religion, where to find translated health information, and Queensland Health multicultural policies, plans and initiatives. The folder has been distributed to all Queensland Health clinical service points (hospital wards, clinics, treatment centres and community health centres) and is updated regularly.